A phone system has capabilities that go beyond normal phone services. When placing a phone call to a business that does not have a phone system, you will reach either reach the person you intended, hear the busy tone, receive no answer, or be asked to leave a message. Even if you reach an actual person at the organization, you could be greeted differently depending on who answers the phone. Without a phone system, it can be difficult to transfer callers, so you may be asked to hang up and call back using a different number. 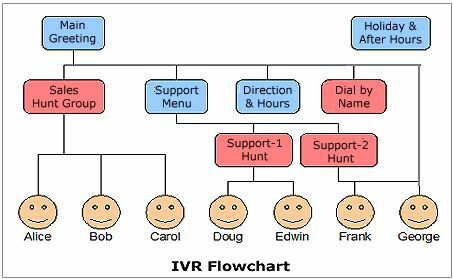 It’s important to realize that a phone system with auto attendant features is far more complex than simply having voicemail. The ultimate goal of an auto attendant is to make sure your caller reaches their intended party at the point of initial contact. In addition, auto attendant features ensure that all callers receive the same greeting and connects your caller to an actual person, every time, with find-me, follow me and live receptionist features. Once all routing options are exhausted, the caller might be asked to leave a message, but only after the call has already been directed to the appropriate department or person. The best part is that all of the instructions for how to handle calls are incorporated into the system and happen behind the scenes, making transitions seamless for customers. You can set your auto attendant features to find the next available agent. There are three key elements to having a really impressive phone system. If you’re looking for even more ways to differentiate your business from the competition, consider using a professional voice service, such as Voice Bunny, for your outgoing messages. Voice Bunny gives you access to numerous voice actors, representing a wide array of styles, who can create custom messages for your organization. You can enhance your company’s brand by the type of voice and background music that you select. Voice Bunny has a variety service options and price points, so you can easily find what best fits your image and budget. Here are a few examples: sample of an auto attendant greeting, on hold, and voicemail messages. Your phone and auto attendant system should be used as a tool in your company’s arsenal. By enhancing your system’s features in professional and unique ways, you can set yourself apart from the competition! This entry was posted in Auto Attendant, Halloo, Virtual Phone Systems, Voicemail and tagged auto attendant greeting, on hold messages, phone systems by Jim Li. Bookmark the permalink.